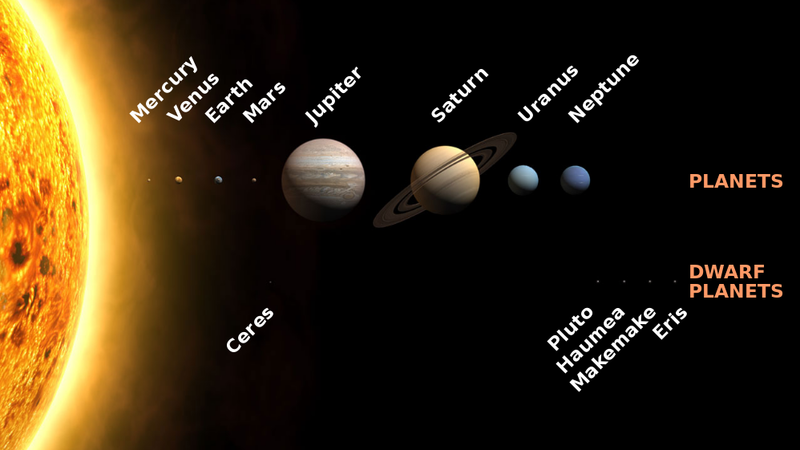 The Earth and the other planets in our solar system revolve around the Sun. That is commonplace knowledge now but it was a radical and revolutionary idea when Nicolaus Copernicus published it in 1542. Today we take it for granted that the Sun is the celestial body that the planets revolve around. Knowing that central fact, it is worth taking the time to consider both the great distances between the Sun and the planets as well as some basic facts about each of the planets. In that manner, we can paint a picture of the solar system; our celestial backyard. The Sun is a star and the center of our solar system. It is classified as a yellow dwarf star. It is made up mostly of hydrogen (73%) and a smaller percentage of helium (25%). The rest of the composition of the Sun consists of other elements such as oxygen, carbon, and iron. At its core, there is a process called nuclear fusion that results in the intense heat and the dazzling brightness that characterize the Sun and bring light and warmth to the solar system. The Sun has so much mass that it accounts for 99.86% of the mass in the solar system. Mercury is the closest planet to the Sun. As with all the planets, Mercury is not always the same distance from the Sun. The closest distance between Mercury and the Sun is 46 million kilometers or 29 million miles, the farthest distance is 70 million kilometers or 43 million miles, with an average distance of 57 million kilometers or 35 million miles. One of Mercury’s most outstanding features is a surface that is full of craters because the planet lacks an atmosphere that is capable of burning up meteors before they strike the surface. It also is too close to the Sun to have an even temperature. The side of the planet facing the Sun can reach 840 degrees Fahrenheit (450 degrees Celsius). With a diameter of 3,031 miles (4,878 kilometers) it is just slightly larger than Earth’s moon. It takes 88 Earth days to orbit the Sun. Venus is the second closest planet to the Sun. The closest distance between Venus and the Sun is 107 million kilometers or 66 million miles, the farthest is 109 million kilometers or 68 million miles, with an average distance of 108 million kilometers or 67 million miles. One of the most outstanding features of Venus is gravitational pressure, which is so great it would crush a person. It also has a toxic brew for an atmosphere. That atmosphere prevents the escape of heat, causing Venus to be even hotter than Mercury. It has a diameter of 7,521 miles (12,104 kilometers). It takes 225 Earth days to orbit the Sun. Our beloved home! The Earth is the third planet from the Sun. The closest distance between Earth and the Sun is 147 million kilometers or 91 million miles, the farthest is 152 million kilometers or 94 million miles, with an average distance of 150 million kilometers or 93 million miles. The most outstanding feature of Earth is its life. It is the only planet in our solar system that supports life, and a great abundance and variety of life at that. An atmosphere that is calibrated to support life and an abundance of water (two-thirds of the Earth is covered in it) have made that possible. It has a diameter of 7,926 miles (12,760 kilometers). It takes 365 days to orbit the Sun. Mars is the fourth planet from the Sun. The closest distance between Mars and the Sun is 205 million kilometers or 127 million miles, the farthest is 249 million kilometers or 155 million miles, with an average distance of 228 million kilometers or 142 million miles. The most outstanding feature of Mars is the red color of its soil, giving it the nickname the “red planet”. The color is the result of iron oxide in the soil, the dust of which permeates the atmosphere. A cold desert now, with snow and ice, it was once wet and much warmer. It has a diameter of 4,217 miles (6,787 kilometers). It takes 687 Earth days to orbit the Sun. Jupiter is the fifth planet from the Sun. The closest distance between Jupiter and the Sun is 741 million kilometers or 460 million miles, the farthest is 817 million kilometers or 508 million miles, with an average distance of 779 million kilometers or 484 million miles. The most outstanding feature of Jupiter is its size. It is, by far, the largest planet in our solar system. The other outstanding feature is the Great Red Spot, a permanent and enormous storm which has been a perpetual feature of Jupiter for centuries. It is a gas giant and composed, in large part, of hydrogen and helium. It has a diameter of 86, 881 miles (139,822 kilometers) and takes 11.9 Earth years to orbit the Sun. Saturn is the sixth planet from the Sun. The closest distance between Saturn and the Sun is 1.35 billion kilometers or 839 million miles, the farthest is 1.51 billion kilometers or 938 million miles, with an average distance of 1.43 billion kilometers or 889 million miles. The most outstanding feature of Saturn is the series of incandescent rings that surround it. The rings are composed of ice and rock. Like Jupiter, Saturn is a gas planet made up of hydrogen and helium. It has a diameter of 74,900 miles (120,500 kilometers). It takes 29.9 Earth years to orbit the Sun. Uranus is the seventh planet from the Sun. The closest distance between Uranus and the Sun is 2.75 billion kilometers or 1.71 billion miles, the farthest is 3.00 billion kilometers or 1.86 billion miles, with an average distance of 2.88 billion kilometers or 1.79 billion miles. The most outstanding feature of Uranus is its very unusual orbit. It is the sole planet in possession of an equator that is nearly at right angles to its orbit. As a result, it actually orbits on its side. Its atmosphere contains Methane that gives it a blue-green color. It has a diameter of 31,763 miles (51,120 kilometers). It takes 84 Earth years to orbit the Sun. Neptune is the eighth planet from the Sun. The closest distance between Neptune and the Sun is 4.45 billion kilometers or 2.77 billion miles, the farthest is 4.55 billion kilometers or 2.83 billion miles, with an average distance of 4.50 billion kilometers or 2.8 billion miles. The most outstanding feature of Neptune is just how far away it is from the Sun. In fact, it is over 30 times as far away from the Sun as our Earth. Also of note is the fact that it has winds so strong and fast that they sometimes exceed the speed of sound! It has a diameter of 30,775 miles (49,530 kilometers) and takes 165 Earth years to orbit the Sun. This is information everyone should know! Very interesting. This helped me in Science, thanks!